You may be asking yourself, why would I create a web page on my website regarding boring concrete slabs? Ahhhh...because of the journey I took.... to get to the point when the concrete was poured. Every time I need to hire a contractor, it is the same old bull-poo. You find a company name and you call them up. Rarely does anyone actually answer the phone. So I leave a message. In clear English, I leave my name, number, and a brief message. Then I wait for the return call........which 90% of the time, rarely comes. Rinse and repeat. Over and over again. Oh.......and then there are those that DO return your call. 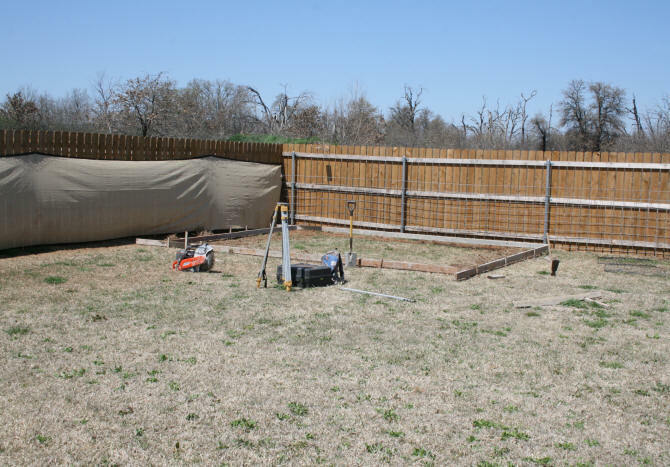 You arrange for them to come-by to see the job site, take measurements, give you an estimate. You give them the address and arrange a time. Then they don't show-up. Then there are the ultimate no-shows. They come to your house, they give you an estimate, you agree to the price. You then schedule the date and time for the work to be done. You take time off from work, you schedule a kennel for the dogs.....You basically rearrange your entire life for this contractor who........wait for it.......does not show up. No phone calls. Does not return your calls. If you paid him any money, you are now totally screwed. So far, I have not lost any money. Lucky? Perhaps. Sometimes, it is just a feeling I have that something is "off". Knock on wood. In the past, on my website, I just mentioned the problem with trying to get hold of contractors. I did not name names. Hell, now I will. Contractors need to realize, that when they blow you off....it will sometimes blow back on them. The first problem with finding a concrete contractor nowadays is.......finding a "name" for a contractor. Very few use the paper phone book, if there is one for your area. The rest are online. You can almost guarantee that they don't have their own website, except for large concrete supply companies. There are a few online websites that list contractors like; YP, HomeAdvisor, or Porch. Reviews may or may not be legitimate. There is just no way to tell if a review is legit or not. 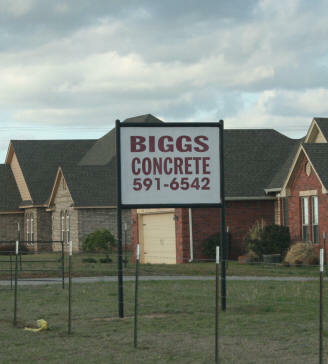 Biggs Concrete, Elgin OK. - Also under David Biggs. Has 2 phone numbers. The first number I called was located on a billboard on Old North Trail Road in far east Elgin. 580-591-6542. Twice I called this phone number, on Mar 18, 2019 and Mar 26, 2019. Both times the recording said that the message mailbox had not been set-up. WTF! You put your number on a billboard and then don't answer the phone and make it impossible for someone to leave a message?!? I called their other phone number 580-591-1106. 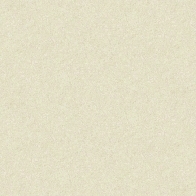 Same days, left messages. No return phone call. Joe Ferring - J&S Construction - 580-595-0982 - Left a message. Did not call me back. 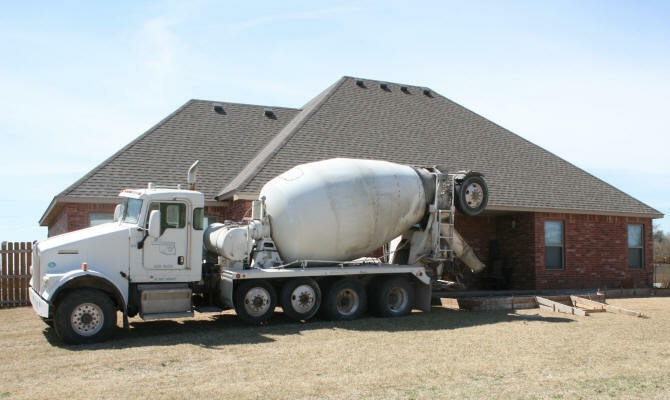 Archie Garret - Residential Concrete - 580-353-9893 - I save the best for last. I called and left a message on Mar 19, 2019. - He called me back the same day. - Came by the house on the same day. - We talked about the job requirements. - He gave me an estimate. I agreed. - Monday, Mar 25 came and went. No Archie, no phone calls, no return phone calls. Fortunately, I did not pay anything. I was going to do that on the Monday they showed up. - where a phone call was returned or an offer was made to help in some way. There were some contractors whom I did have contact with, which resulted in a short pleasant phone conversation......like how a business should be run. Jim Adams, LLC - out of Duncan, OK. Actually answered his phone. Was nice. Explained that he did not do poured concrete jobs, took my name and number to give it to this "other guy" who does. Lawton Transit Mix - Concrete supplier only. Took my name and number and gave it to contractor Carlos Medrano who contacted me the same day and was very nice on the phone. However, he was too late because I had already found a concrete guy an hour earlier. But I am holding onto his name and number....... just in case. Juan's Concrete, whom I also found on the Home Advisor website, was the guy that Jim Adams, mentioned above, referred my name to. I had also left a message for Juan earlier that day. When he called, he just happed to be in Elgin (he lives in Duncan.) And..... he was in-between appointments and could be at my house in 15 minutes. What are the odds of that??? He arrived, took measurements, provided me an estimate, which was around the same price as the Archie Garrett estimate. I agreed with the estimate and we set a date to begin the project on Apr 2, 2019 at 9:00 am. When we moved into our new house, we knew that we would eventually need to extend the little under-roof-patio it had, out into the backyard. For that reason, when we purchased the house, I held back $10,000 of the house down payment. With this money, I needed to budget 3 items: 1) The cement for the patio and a storage shed, 2) a storage shed, and 3) gutters. When we moved into this house last summer, it was too hot to have cement work done. A couple months of 90's and 100's Autumn arrived and left in a blink of an eye and then there were temperatures in the 30's. Too cold to have cement work done. 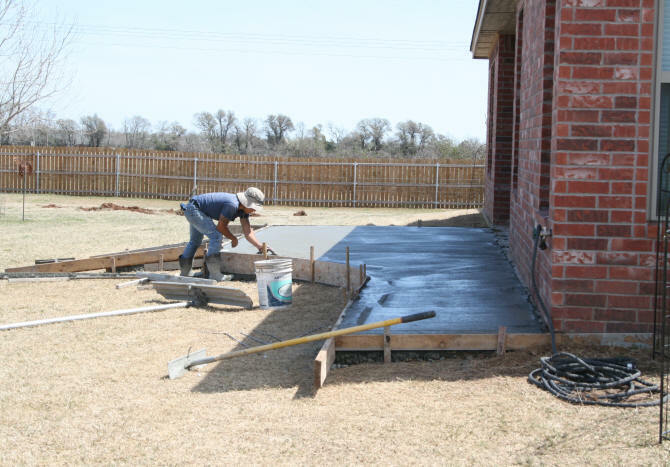 Spring and Fall, the perfect time for cement work, are very short seasons in this area. Since the beginning of March, I have been closely monitoring the weather waiting for the time when no more day-long freezes were in the forecast. This happened at the last half of March 2019 and why I started to make my calls on March 19, 2019. Now I am a week behind because of the contractor who did not show-up on Mar 25th. Everyone else is also scrambling for a concrete contractor. A lot of new houses in this area have teensy tiny patios in big huge yards. After living in the house for 9 months, I now have a better idea of where I wanted the concrete slabs to go. So this 9 month delay, could be seen as a blessing. What happened during this time period was rain and where it pooled in our backyard. The water turns into a lake during heavy downpours, right where I had wanted the storage shed to go, in the southeast corner of our backyard. If I had immediately had a storage shed installed in this corner when we moved in, it would have been a costly mistake, even with a cement foundation. The second option was the northeast corner which was worse. 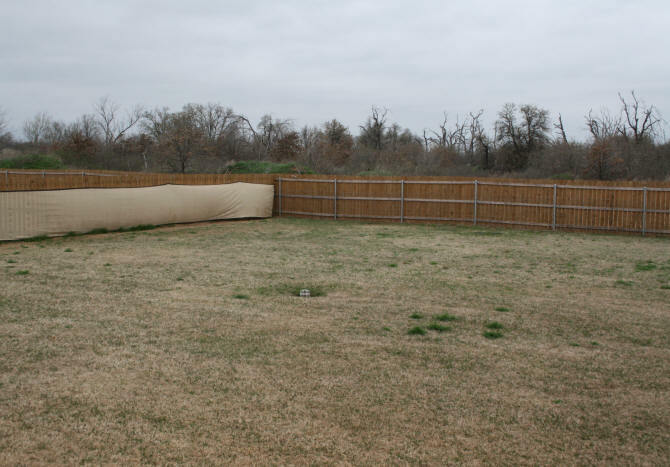 The southwest corner is out of the question because our septic system is there. The only corner left, was the northwest corner of our yard. 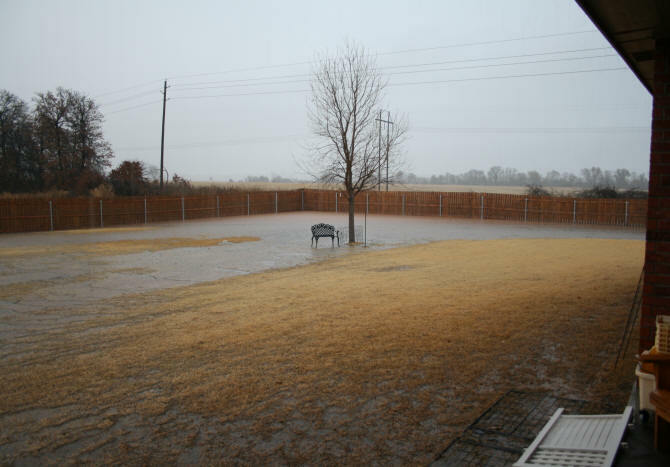 Northeast corner of yard on Dec 26, 2018 during heavy rain. After the rain stops, the pond remains for a few days. The storage shed WILL NOT go on this side of the yard. I want this storage shed to be as far away from the house as possible because it is where flammable materials like gasoline and propane will be stored. So the northwest corner of the yard is where it will go. The rain does pool a little in this area during downpours....but with a 5" slab of concrete and the raised bottom of the shed, the floor of the shed will not have water sitting in it after it rains. Based on the rain we have had this past 9 months, only a couple inches of rain pools here until it moves downhill or is soaked into the ground. 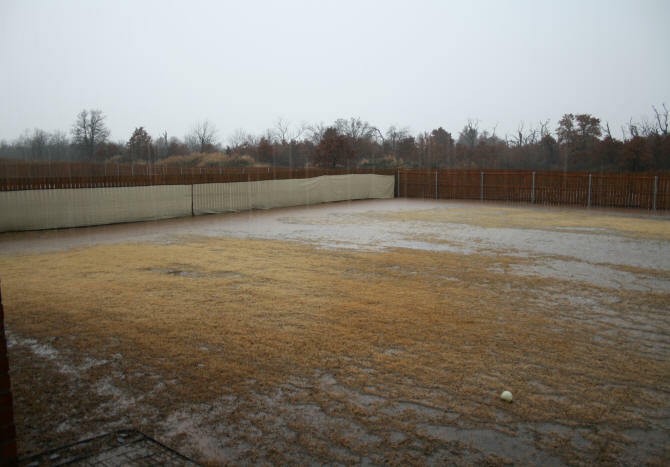 Northwest corner of yard on Dec 26, 2018 during heavy rain. After the rain stops, this water disappears. Northwest corner of yard on Mar 29, 2019. Ready for cement slab. The type of shed I decided to get was a 12 x 16 Tuff Shed. I needed to balance the size and price. I needed something big enough for a riding lawn mower to be rode into AND to store the yard related junk we have. It also had to be tall enough for my 6' 2" husband to walk into without hitting his head. 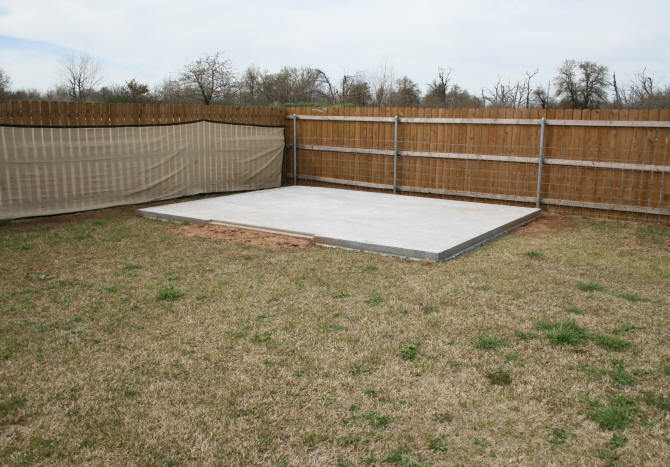 Plan for the storage shed foundation. the edge of the concrete. A simple 12' x 16' shed was all I could afford with my budget. The only additions I added was a 3' x 3' window, vents on 2 walls, and a 6' wide double door. I will be painting the shed myself and creating the shelving and hanging system inside. Solar powered barn lights will provide lighting inside. 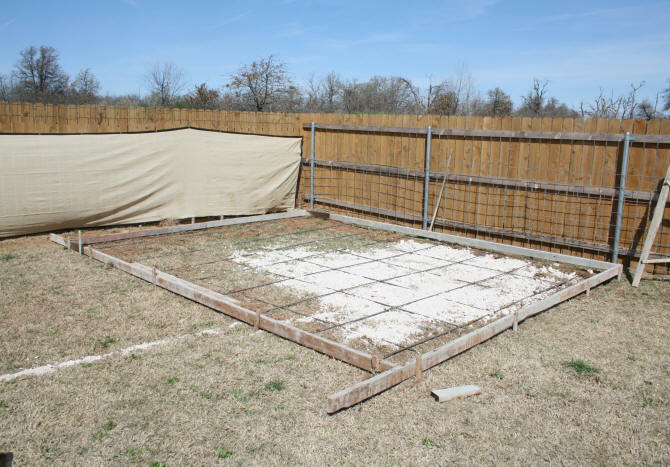 With my shed picked out, I could then determine the size of the concrete slab. 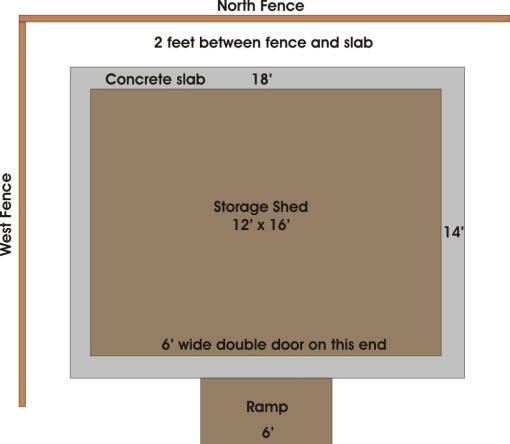 I decided on a slab that is one foot wider than the shed. 14' x 18'. This way if something is leaning against the wall of the shed, it can rest on the concrete and not the ground. This will also give us 3' of space between the shed and the fence. The 252 sq ft of concrete will be 5.5" high. As mentioned above, the existing patio area (if you could call it that), is only 7' deep. Without the gutters, the rain comes off the roof and hits the now absent sod, splattering mud all over the cement. Then the dogs trample through this mud to come back into the house. I feel like I live in a very expensive barn. We need to cover the floor in blankets to try and catch the muddy paws. AND there are three rugs the dogs walk over, before they get to the floor blankets. Mud everywhere!! Having cement under the edge of the roof will eliminate the muddy quagmire issue. The gutters will help further. I eventually want cement around the entire back of the house. 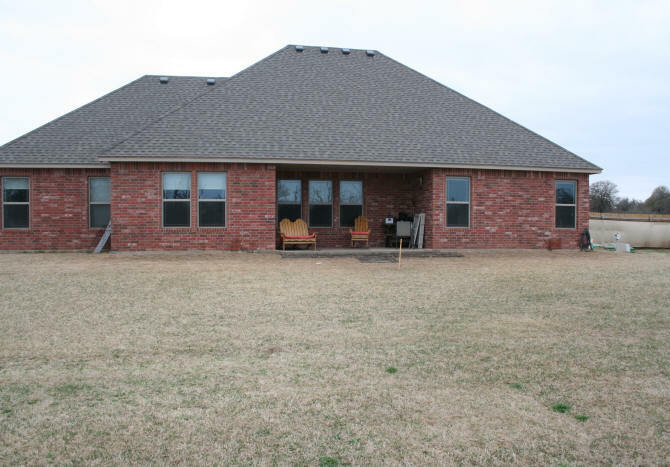 I want to be able to walk around the outside of the house in bad weather without walking in mud. However, I do not have enough money to pay for all this cement AND purchase the storage shed and gutters. So, I am going to do the patio in sections. Additional sections will be added when we have the money. For the patio this year, I will extend the existing patio by 10 feet. To the right of this extension will be a curved section that forms a sidewalk that will narrow to 3 feet along the 19 foot section of the house. Plan for the patio on the back of the house. Current patio to be extended out 10 feet. 19 foot house section on the right to have a 3" sidewalk added that expands to 10 feet with a curve. Ramp was added because of the high drop-off. The pale yellow areas on the left, will be added at a future date. 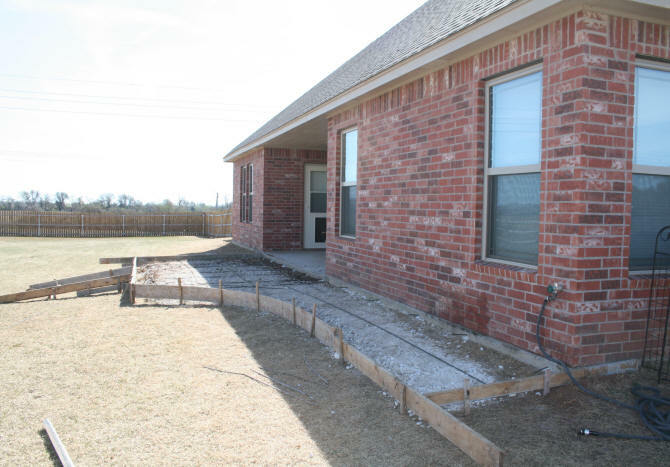 The contractor for this job was Juan's Concrete from Duncan, OK. 580-606-8097. The price for this job was just under $3000.00, which is below the national average for a poured concrete job. 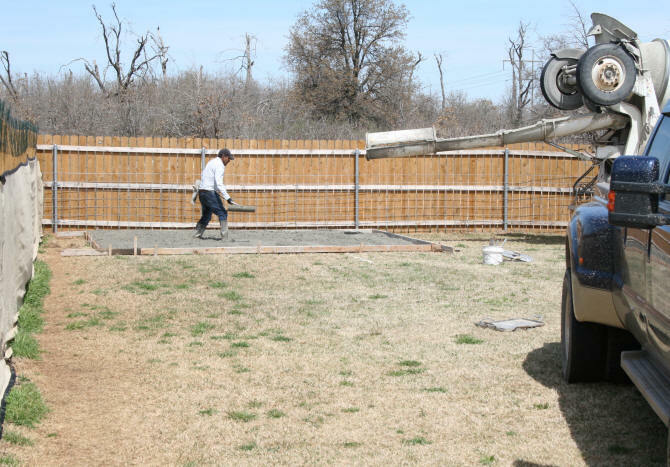 In SW Oklahoma, the price for concrete is inexpensive because the materials are readily available. The concrete company is in Fletcher, OK. About 5 miles from our home. As mentioned above, Juan contacted me soon after I left a message on the same day. He gave me the estimate, I agreed, and he wrote up a contract. I paid him a $1000 deposit. The rest would be payable when the job was completed. The job was scheduled to begin on Tue, April 2, 2019. I received a phone call from Juan about 10:30 am on Monday, Apr 1, 2019. 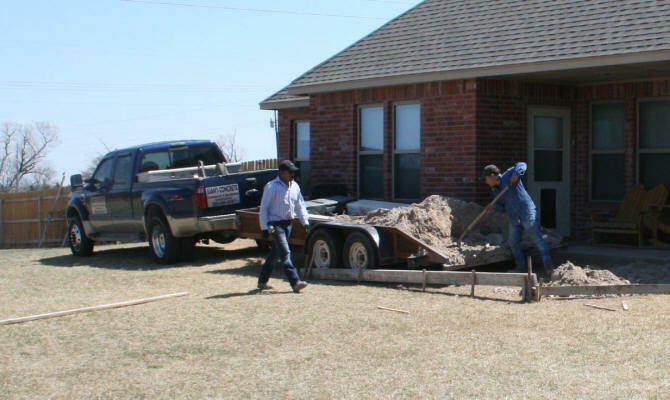 He explained that he had finished a job in Lawton early and wanted to stop by our home for a few hours to start the job early. Which means he could have the concrete poured on Tue instead of Wed.
For some folks, this could be a problem. I welcomed the early start. First off, it means I don't have to keep the dogs cooped up as long. Second, the weather report had changed for Wednesday. Evening thunderstorms with possible hail were now in the forecast. Juan and his helper showed up about an hour after his phone call on Mon, April 1 and started setting up the forms for the cement slabs. While working on the patio, Juan realized that the grade was a little steeper 10 feet away from the house, than he had originally thought. I had warned him that it was about 15-16 inches based on my measurements. He said he measured 17". Close enough. Therefore, he needed to pick-up some aggregate to raise the area up a little. He was back in 30 minutes with the aggregate. Forms being laid for the storage shed foundation. Juan and his helper showed up on-time at 8:45 am. He explained that the concrete truck would be here at 10:30 am. I made a last minute change on the job. I added the patio ramp. This was not part of the original estimate and I paid extra for the work and concrete. The past evening I had thought about the height of the patio and my husband's hip and knee problems and my back and feet problems. I should have made this ramp request sooner. My fault. However, Juan accommodated my request and added the ramp for an extra $200. Juan and his helper added the rebar and finalized the forms for the concrete in preparation for the cement truck's arrival. Patio forms complete. Ramp added. Ready for concrete. Foundation forms complete. Ready for concrete. They finished their work......and then we spent 2 hours waiting for the cement truck, which was running very late. The only major problem for this job was the cement truck. The driver was young and inexperienced. The yard soil too soft for a large truck. 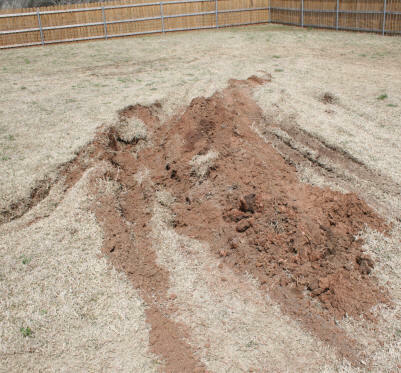 The photo to the right is the result of the driver spinning a tire in the ground until it had dug a 2 foot deep trench. See the photo on the right. Hard to tell the depth in the photo, but our medium sized dogs disappeared from view when they ran into it. If he did not get out of the hole, a tow truck would have been called to pull him out. More damage to the lawn. 2 foot deep gouge in lawn made by cement truck. This was filled and leveled the next morning. Juan and his 3 helpers returned this morning to flatten and fill-in the section of our lawn that the cement truck had damaged. The had a pickaxe, wheelbarrow, and shovels. Within an hour the ground was pretty much flattened out. Not perfect, but acceptable The sod is just starting to turn green, so the now barren spots, will be filled-in in a couple of months. There were thunderstorms late this evening that produced small pea size hail. Not a problem...the concrete already had over 24 hours to cure. And oh my goodness what a difference!!!! 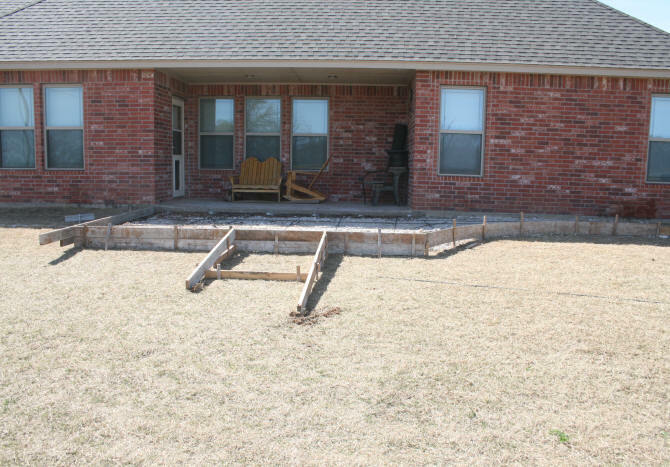 No more rain pounding sod and splattering mud onto the under-roof patio. 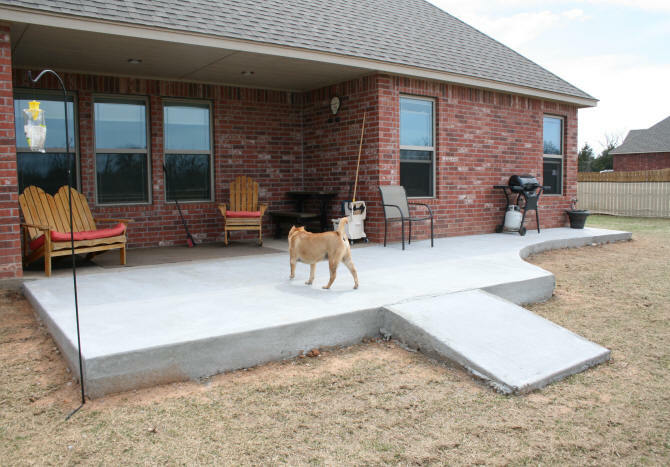 As you can see in the above photos, the edge of the concrete is rough around the patio. 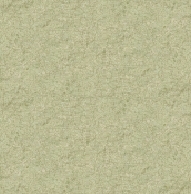 I will be adding something like a brick facade to the horizontal surfaces and planting some bushes around the edges. When I complete this work, I will add photographs to this page. 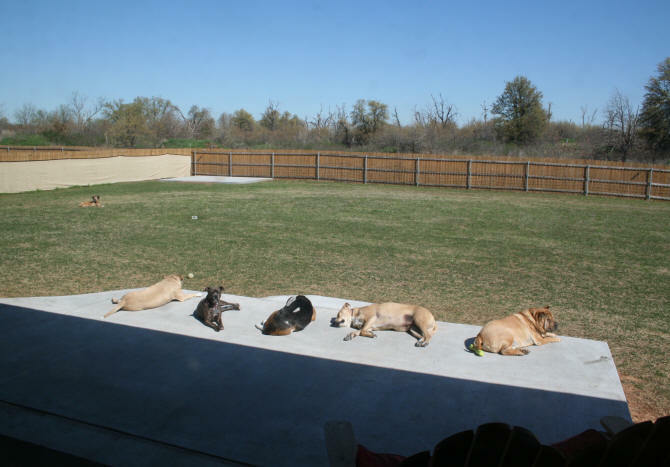 Dogs enjoying the sun on the new extended patio.